The U.S. dollar has appreciated around 12 percent since mid-2014, rising against almost all of our trading partners, with the largest gains against Japan, Mexico, Canada, and the euro area. 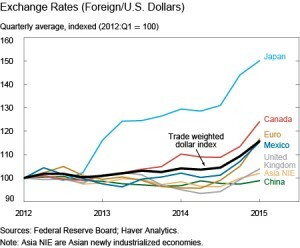 There was far less movement against newly industrial Asian economies and hardly any change against China. Exchange rate movements affect the trade balance by changing the prices of domestically produced goods relative to goods produced abroad, an outcome that in turn affects relative demand. A stronger dollar makes U.S. imports relatively cheaper than domestically produced goods, which pushes consumers to substitute towards imported goods and provides firms with relatively cheaper inputs from abroad. On the export side, a stronger dollar makes the price of U.S. exports more expensive when converted into foreign currency terms, reducing U.S. export growth. – A 0.9 percent increase in import values in the first year. – A new reduction in GDP growth by 0.7 percent after two years. The New York Fed trade model does not include other channels through which the exchange rate can also affect U.S. growth. For example, the decline in U.S. exporters\’ profitability could reduce their domestic investment spending on plant and equipment. On the upside, lower prices of imported inputs reduce firms\’ marginal costs, which increase firms\’ profitability. Moreover, lower import prices increase consumers\’ disposable income, boosting consumption of both imports and domestically produced goods and services. Such indirect effects are potentially important, but they are a lot more difficult to quantify.